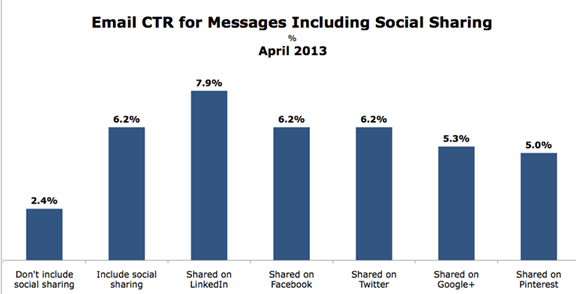 Email marketing is a great way to help develop your relationship with your customers. It’s also a strong tool you can use to gain your customer’s trust, increase repeat business and build brand awareness. And while email marketing sounds simple, it’s important to bear in mind that it can be easy for your message to get lost among the many emails that are constantly bombarding your customers’ inboxes every minute of the day. So, how do you give your email the edge it needs to stand out? We’ve put together a quick guide based on science and research to help you make the most out of your next email marketing campaign ensuring that it reaches your audience’s inboxes in style. But, before we get down to the specific steps, we’ve highlighted the most important parts in this B2B email marketing example infographic below. Infographic sources: Econsultancy, Adestra, Experian and MarketingSherpa. Now, let’s dive straight into the specific steps you can take in order to create the perfect email marketing template design in your email marketing software. How often do you click the “delete” or “spam” button without a second thought after reading an uninspiring subject line? The “from” line: Make it clear who the sender of the email is – keep this consistent with your company’s brand guidelines. Don’t be too clever: Quirky and unusual styles are growing trends in digital marketing, but being too clever or pretentious can be off-putting. Use a voice authentic to your brand, and keep your subject line natural. Think like your audience: What would appeal to you as the audience? What emails do you regularly read, and which ones do you ignore? Do your research, and try looking at your subject line objectively. Subject line length: Keep your subject line to 50 characters or less – give your customers a quick and punchy outline of what awaits them in the email. 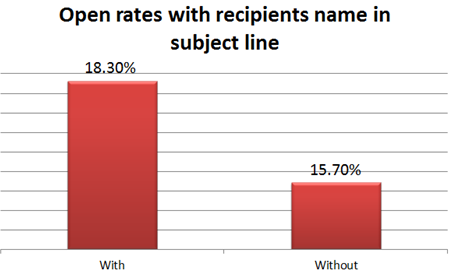 And use personalization, as personalized subject lines can increase open rates from 15% to 18% simply by using the recipients name! You’ve now captured your audience’s attention and they’ve opened your email; great job! But, what greets them inside? You don’t have much time to keep their interest, and the content of your email needs to be clear, relevant, and above all, interesting! An authentic voice and tone are vital to any email marketing campaign, and you’ll want the way you communicate with your audience to reflect the culture and ethics of your brand. If your company is a large corporation with a serious message to broadcast, this will need to be reflected by using a more formal voice and tone. Likewise, if your company has a more relaxed culture, your voice and tone can be more casual and even playful. Your audience is going to want to know why you’re emailing them, immediately. Cut to the chase with a simple introduction – By explaining what you’re offering, and how and why this is valuable to your audience. Make your case compelling, and avoid language that is unclear. Start with the conclusion: put the most important information in the first sentence or two. Keep sentences short: make sure that they are easy to read, and cut out the jargon. Use plenty of paragraph breaks: avoid large blocks of text and try to keep paragraphs to a maximum of 2-3 sentences. Construct the content of your email carefully, and remember the primary objective of your marketing campaign is to ensure that the content stays true to your goals. If the aim of your campaign is to drive sales, you don’t want to bore your subscribers with a lengthy account of your company history, no matter how relevant you think it might be. And remember that if an email is not relevant to the reader, 60% of subscribers will delete the email and 23% will mark the email as spam. 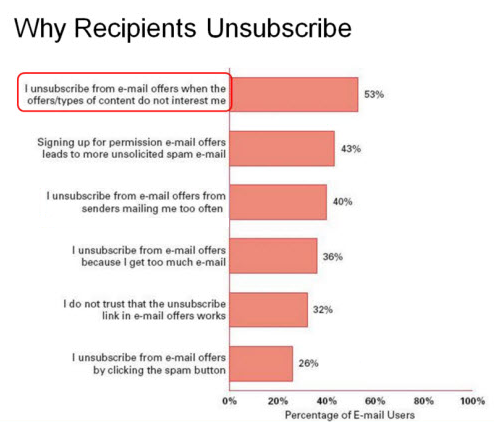 In fact, irrelevant content is cited as the number one reason why readers unsubscribe from your emails. There’s nothing more frustrating than receiving an email that fails to include contact details and unsubscribe options. Your audience may wish to ask you a question, or simply unsubscribe immediately, so be sure to display these details clearly at the top or bottom of your email template. And besides, allowing your readers to unsubscribe when they no longer wish to receive promotional emails helps you cleanse your list so that your email marketing campaigns are only sent to only those who are interested and thus, more likely to convert!. A call-to-action (CTA) is an instruction or set of instructions geared at encouraging your audience to carry out a particular action. This might be something as simple as clicking through from your email to view your website. Whatever you decide on what your CTA is, the first step is to make it visual. CTAs are often one of the most dominant elements of an email and will usually sit within a box and include text, a button, and an image. Consider your text wisely, and use styling such as bold or a different font to make it stand out from the rest of the email. Use the button to clearly indicate the action required, such as ‘Download white paper now’ or ‘Sign up to webinar’. 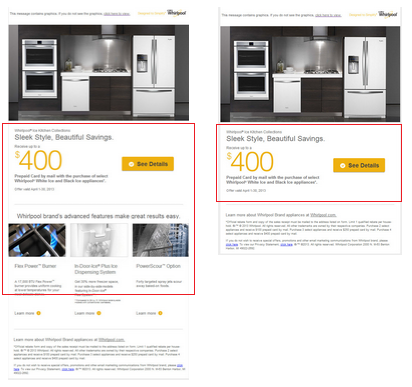 Another point to consider is the number of CTA’s as a case study from Whirlpool shows that when the brand reduced the number of CTAs in its email (sample below) from four down to just one, it achieved a 42% increase in clicks! Make it easy for your audience to forward your emails to their friends, share your content on Facebook and Twitter, and keep up to date with your blog by including social sharing buttons within your email. The design of your email is just as important as your content. If you don’t have a design team in-house, use Canva to create custom designs and AutoClipping when you want to remove background from images. Clear and consistent branding: To enable your audience to recognize and connect with your brand immediately, make sure your branding is clear and consistent and keep in line with company brand guidelines. Include your company logo, and stick to your company’s colour scheme. Clutter-free design: Clean designs are more appealing than cluttered ones, and your content should be structured so that it is easy to follow. Mobile optimization: Consider the platform or device on which your audience is most likely to read your email and make sure that your email is optimized for that device, as 56% of smartphone users have made at least one purchase after receiving a mobile promotional email. Is your subject line irresistible? Have you included social sharing icons? Is your design clutter free? Can your readers unsubscribe if they want to? 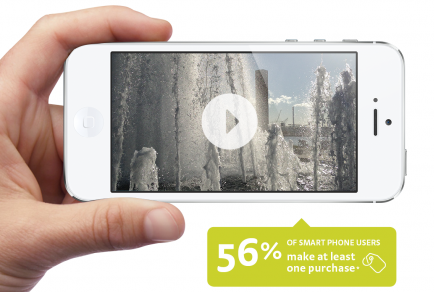 Is your content optimized for all devices? Check each and every sentence for typing errors, grammar mistakes or anything that doesn’t look quite right. You may also want to test your email before you send it to ensure that it looks as it should in as many email clients as you can and the same goes for devices. If the email looks good and you’re happy with it, you’re all set to hit the ‘send’ button and then sit back knowing that your email marketing campaign will be a success! What do you think of the email marketing template infographic? And will you use these email marketing template design tips when you send out your next email campaign? P.S. Looking for more templates for your business? Then download our free guide below. Great info on designing a template. Here is an excellent way to use your list very productively. Create rolling webinars that play on autopilot to promote your offer. Present this product to your email client list. Simply record your webinar one time and let it play multiple times a day as per your schedule. Thanks Myrtle! And I love that suggestion on the rolling webinars! Really nice article. Everything in there! There are now solutions that include good templates with which you are sure not to forget something. Glad you liked the email marketing template infographic, Hugo! I think that choosing a good email template is really important to every marketing campaign. With my current email marketing platform I'm able to create a nice looking and responsive newsletter so it's not a problem for me anymore. Thanks Dale, having a responsive email marketing template is very important! Great article! It's not as simple as I thought, especially if you add the technology requirements. What software would you recommend for non-coders? Thanks Emma! I recommend using a simple solution to get started. Hey Emma, I don't know HTML so I tried several options; I stick with MailStyler for the last two years and I'm happy with it. It's very simple and idiot-proof. The only thing is that it works on Windows only, so if you have a Mac you either have to virtualize a Windows machine or don't use it at all.